Test your skills in this lighthearted battle between friends — from the makers of Age of Empires and Halo Wars! Easy to learn – jump right in and play! Random playfields keeps battles fresh! Expand your roster with additional teams! Invite your Twitter followers to play! 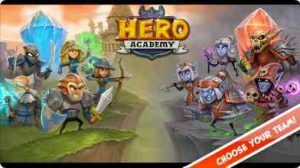 Follow us on Twitter @HeroAcademy, and visit our Facebook page at HeroAcademyApp! Note: Hero Academy is compatible with iPhone 3GS or newer models only.